Industrial revolution? 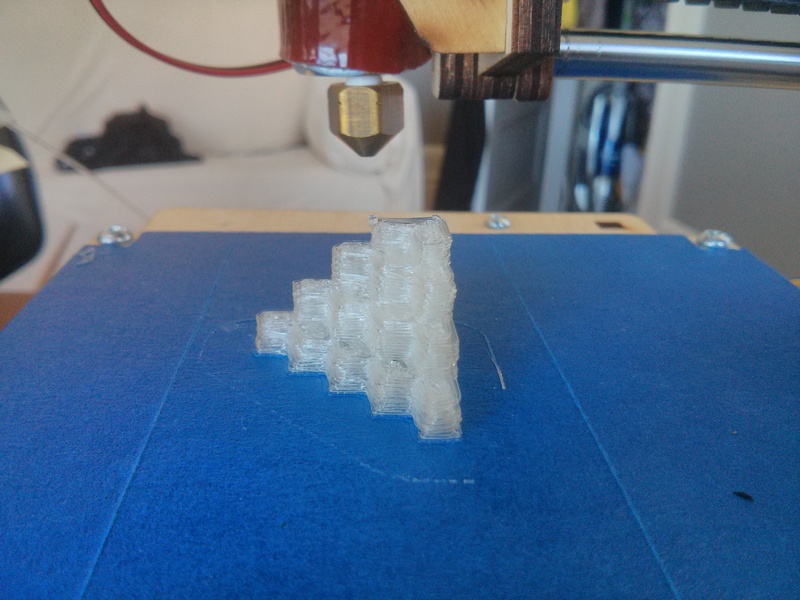 First print was more like a stringy mess of loosely organized plastic. It did get better. I have been spending a fair bit of time the past few months getting under the skin of 3D printing. Or vice versa. It was my first research area after leaving my previous job, and so far it has spun off a few projects and given me a couple of new business directions to explore. This is no in-depth analysis of the promises of 3D printing and whether those promises are supported or not. Others have written about that and for a firehose style catch up I suggest trawling through the 3D Printing Industry site. 3D printing is being disrupted. The technology (or access to it) is changing and new users, usage patterns and business models result. The technology introduced is smaller and cheaper, it is not able to do things the traditional, industrial customers of 3D printing technology need it for – it ticks all the boxes. This is true whether looking at the FDM (Fused Deposition Modeling = squeezing out melted plastic) process used in the first wave of consumer printers, or the more advanced technologies for handling metals and other materials still only possible with expensive, industrial grade machinery. For the technologies not being sold to consumers yet, they are being made available through printing services like Shapeways etc., removing the need for large upfront capital investments. I might challenge myself on this one some other time, or at least dig a little deeper on the whole “disruptive technology” view on things. I think that label is a bit cheap to apply and is often assumed to mean “awesome” and “guaranteed success” instead of “painful”, “soul-sucking” and “most likely bankrupt living with parents”. Another day, another rant. My work for the last six years has largely been as a pixel pusher. I haven’t welded, assembled or built anything besides IKEA furniture for a very long time. Getting to play with 3D printers put me straight back into tinkering mode. First, in terms of tinkering with the machine itself and getting it up and running. Second, when you get to printing, playing around with product designs and getting that first homemade bicycle light holder precariously attached to your bike. Lastly, and my main interest, is getting to work with people who are actually good at making things and figuring out how to help them make the most of what the new technologies have to offer. It bridges hardware and software. There is the hardware aspect of making the printers themselves and getting them in the hands of consumers. More interesting to me is the aspect of what other hardware products will be enabled by having 3D printing accessible as a manufacturing method. Examples so far, outside of aerospace and novelty products, are things like custom jewelry and prosthetic limbs. Being a digital form of manufacturing based on design files, software patterns start applying to the creation of hardware using 3D printing. As complexity is free in 3D printing, software abstractions on top of the technology is what will allow it to solve real problems for individual end-users. 3D printing is directly and indirectly enabling a whole wave of new businesses and a few new business models. Whether it is putting a design in the Shapeways shop to make a few extra bucks, launching a product for direct sale manufactured on your own set of printers, creating more accessible design tools, or something else entirely.